In the West the word ‘Yoga’ is most commonly associated with the physical practice of asana, which means ‘seat’ or ‘posture’. Contrary to popular belief ashtanga yoga asana is not a fitness system or a series of gymnastic exercises but part of a larger process of spiritual rebalancing. "To learn how to achieve concentration, the body first must be purified, and then mental strength developed. The method for purifying and strengthening the body is called asana. When the body is purified, the breath also becomes purified, and the diseases of the body are eliminated." The yogi doesn’t look to the heavens to find God, but instead knows that God is found within. 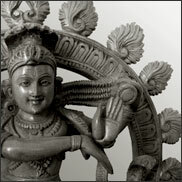 Asana represents the inward journey, the journey towards The Inner Sun. If practiced with sustained dedication for an extended period of time, asana returns the mental, emotional and physical aspects of our spiritual being back into a state of harmony. The yogi finds Heaven in attaining an equilibrium of body, mind and emotions, which allows his true divinity to flow into his consciousness. The yogi knows that if the journey of life is to be traversed with ease, his vehicle must be well maintained and tended to. Your physical body is the vessel that you are sailing in upon the ocean of your life. Sometimes the ocean is calm and the journey feels easy. Other times the ocean is stormy and rough, and we struggle to stay afloat. If we do not take care of our precious vessel the experience of this ocean is much more threatening than if our vessel was ‘watertight’ and ‘sea-worthy’. The practice of asana moves, stretches and manipulates the body, cleansing it of harmful toxins and eliminating disease (dis-ease). Gradually, over time, the challenging nature of the postures correctly realigns the body’s physiology, bringing agility, balance and greater vitality, returning the physical cells back to their natural state of wellbeing. As well as rebalance the body, asana also acts to quieten the busyness of the mind, allowing our awareness to explore the present moment – the only point of personal power we have to change our experience of life. Since our thoughts are only ever centred on the past or the future the mind is never fully present, the body however cannot exist in any moment other than the present one. So, by focusing our attention upon the physical sensations of asana, and listening to the Ujjayi breath, the mind becomes still, allowing our consciousness to begin to expand. The yogi knows that the body represents a detailed map of our past. Asana invites us to acknowledge the past and let it go so that it no longer affects the way we think, feel and behave. All of our negative beliefs – about ourselves, others and the world – are a result of unprocessed negative emotions experienced in the past in relation to a difficult circumstance or event. These negative emotional memories are stored in our physical cells along with the toxic substances that we shovel into our bodies disguised as food. Because our erroneous beliefs and habitual negative behaviour are attached to the negative emotions stored in the stagnant cellular memory, when we manipulate the body through asana we dislodge their bonding and begin to shift long-held negative thought and behaviour patterns. Disease (dis-ease) is merely a physical symptom of emotional, mental or nutritional imbalance within the bodily environment. Our bodies are constantly regenerating. In fact the only reason why physical problems and diseases remain in the body is because the cellular environment from which the healing takes place is polluted by these harmful emotions and toxins. So when we begin to flush them out we are allowing the body’s natural state of wellness to return. Asana also dissolves our attachment to the False Self – the sense of “I am” that our minds desperately cling to – which was created as a survival strategy when we were young. Any limiting concepts such as “I am my job”, “I am my reputation”, “I am my past” are shown to be illusions, allowing the Divine Spark of our true nature to emerge from within. As we begin to stabilise the fluctuations of the mind through focusing on physical postures our emotional state benefits too. Our emotions are driven by our thoughts, so as the mind becomes still so too do the emotions. The result is an experience of profound peace and serenity during or after our asana practice. Although asana is the third of Ashtanga Yoga’s eight (ashtau) limbs (anga), for most people who come to yoga it is the first to be focussed upon (i.e. when they try a yoga class for the first time), however from a dedicated and committed asana practice a realignment of the first two limbs (Yama and Niyama) will usually emerge.